Political relations: In 1972 Mongolia and Australia (under Prime Minister William McMahon, Liberal Party of Australia-Country Party of Australia coalition) have established diplomatic relations. Bilateral relations have accelerated since the onset of democratic and free-market reforms in Mongolia during early 1990s. 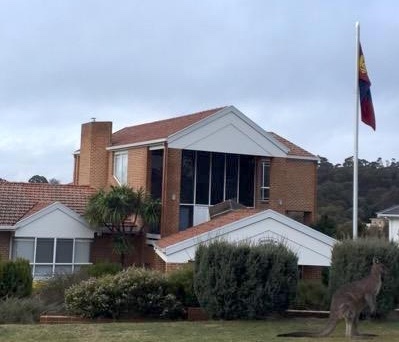 Mongolia opened its diplomatic mission in Canberra in 2008; Australia (AusTrade) has opened its trade office in Ulaanbaatar in 2011, which later was upgraded into Australian Consulate-General. Mongolia and Australia agreed in 2007 developing bilateral relations under expanded partnership. 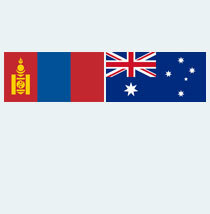 Two governments noted in 2011 that Mongolia and Australia share common strategic interests and objectives in the Asia-Pacific region, including the peaceful development of the region. First consultations between the Ministry of Foreign Affairs of Mongolia and DFAT of Australia took place in Ulaanbaatar in 2014. 1994: Governor-General of Australia Bill Hayden and Foreign minister The Hon. Gareth Evans visit Mongolia. 1997: President of Mongolia Mr. Punsalmaagiin Ochirbat visits Australia. Mongolia appoints its Honorary Consul in Sydney. 2007: Australian Foreign minister the Hon. Alexander Downer visits Mongolia. 2012: Australian Foreign minister the Hon. Bob Carr visits Mongolia. 2014: Minister for Foreign affairs of Mongolia Mr. Luvsanvandan Bold visits Australia. Parliamentary exchange: There have been a number of visits between parliamentarians of the two countries, which started in 1991. The most recent visits include: speakers of parliaments of the two countries exchanged visits respectively in 2005 and 2007, while in 2009 and 2010, two delegations from Mongolia led by Members of Parliament visited Australia, and a group of four Australian Members of Parliament from the Australia-Mongolia Parliamentary Friendship Group paid a visit to Mongolia, In January 2011, the Speaker of the House of Representatives of the Australian Parliament attended the Asia Pacific Parliamentary Forum hosted by Mongolia. In September 2012, the House of Representatives’ Standing Committee on Regional Australia visited Mongolia. Friendship groups have been established in both parliaments, and making its own contributions towards expansion of bilateral relations. Several politicians that studied in Australia serve in current Parliament of Mongolia. Education and people-to-people links: Australian Government has been offering educational scholarships to Mongolian students since 1994. To date, around 400 Mongolians have received education in Australia, mostly through these scholarships, however the number of self-funded students to study in Australia is increasing. Today, around 800 students study across Australia, Three Australian students would go to Mongolia in 2015 under the “New Colombo Plan” program. Reciprocal introduction of Work and Holiday visas is on the bilateral agenda. Since early 2000, Mongolia received more than 200 Australian volunteers, who worked in different areas and institutions in Mongolia, helping in strengthening of society in Mongolia. Agriculture: The Department of Agriculture, after sending its delegates to Mongolia in 2012, produced a report on Potential cooperation opportunities between Mongolia and Australia in agricultural sector. ACIAR, the Australian center for International agricultural research, sent its delegations to Mongolia twice in 2013 and 2014 respectively. Based on these visits, the Centre is about to start a multi-stakeholder project in Mongolia, hopefully commencing in 2015. Defence: Defence cooperation is the new page within the bilateral relations. Mongolia and Australian peacekeepers serve in several locations around the world. Each year several Australian soldiers attend the “Khaan Quest” international peacekeeping training in Mongolia. In 2012, Chief of General staff of Mongolia LTGEN Ts. Byambajav visited Australia. 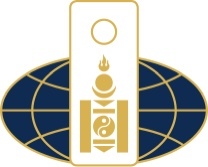 Upon invitation of Australian Department of Defence, a Mongolian officer will attend command and staff courses at the Australian Defence College in 2015. The two defence ministries are to conclude the cooperation document. Mongol studies: In 2011, a Mongolian studies center was established at the Australian National University. In 2012, it was upgraded into the Mongolian Institute. The Institute is making significant contribution towards Mongolian studies in Australia. The institute organises the conferences on Mongolian studies as well as the “Mongolia updates” annually. Also, the Institute provides Mongolian language short training course at the beginning of each year. The Government of Mongolia provides small financial support towards Mongolian studies in Australia. World-renowned scholar Prof Igor de Rachewiltz, an emeritus Fellow at the ANU’s College of Asia and the Pacific, works closely with Mongolia Institute. Tourism: Every year thousands of Australian travel to Mongolia, also the number of Mongolians visiting Australia is increasing, reaching nearly 2000 in 2013. Several Australian companies organise tours to Mongolia.